President Trump said on Saturday that he had brought up with America’s closest allies the dramatic prospect of completely eliminating tariffs on goods and services, even as he threatened to end all trade with his counterparts if they didn’t stop what he said were unfair trade practices. Speaking to reporters at the end of a contentious weekend meeting of the Group of 7 nations in a resort town outside of Quebec City, Mr. Trump said that eliminating all trading barriers would be “the ultimate thing.” But he railed about what he called “ridiculous and unacceptable” tariffs on American goods and vowed to get rid of them. Several of the leaders responded aggressively to Mr. Trump’s demands — as they have repeatedly in public — listing their own complaints about American policies on tariffs and other trade measures, the official said. Several countries have said publicly they will retaliate against the United States’ new steel and aluminum tariffs with increased tariffs of their own. “If they retaliate, they’re making a mistake,” Mr. Trump said, suggesting that the trade imbalance between the United States and those countries would make tariff increases more destructive for their economies. Well, may be not. That’s an incredibly myopic view. Trump apparently is unaware that “those countries” know how to protect themselves, as Catherine Rampell explains in her column, Trump is waging a trade war in the dumbest way possible. President Trump says we need to be “smarter” in how we deal with other countries. And yet his approach to extracting concessions from our trading partners has proved very, very dumb. Notwithstanding Trump’s Twitter declarations, trade wars are neither good nor easy to win. In a trade war, every side loses, experiencing lost jobs, crippled businesses and higher prices for consumers. We learned that the last time we had a full-blown global trade war — in the 1930s after Congress passed sweeping tariffs that exacerbated the Great Depression. Even so, it’s possible for some countries in a trade war to lose more than others. And that’s the position Trump is leaving the United States in, by taking perhaps the worst possible approach to economically bullying other countries. U.S. steel prices have risen nearly 40 percent since the start of the year, and are now more than 50 percent higher than in both Europe and China, according to the S&P Global Platts benchmark price assessment for hot-rolled coil, the bellwether product. But that’s not the only reason these tariffs are going to hurt us a lot more than they hurt everyone else. The bigger problem is how other countries, including our friends and military allies, are responding to our protectionist measures. Collectively Canada, the European Union, Mexico, Russia, India, Japan and Turkey have already announced $40 billion worth of retaliatory tariffs on U.S.-made products. The scale of these retaliatory tariffs isn’t what’s most concerning; it’s the composition. These other countries have been far more strategic about which U.S. products they choose to target than we apparently were in launching this trade war. … these other countries have tried to pick and choose products that their businesses and consumers can easily obtain elsewhere. In fact, when the E.U. recently revised its list of U.S. products subject to retaliation, it decided to remove some items for which non-American close substitutes apparently weren’t available, as the Economist’s Soumaya Keynes pointed out. Even worse for Trump, these angry countries are choosing products with political sensitivities in mind. Hence the appearance of Kentucky-made bourbon, Iowa-farmed pork, Wisconsin-manufactured motorcycles and Ohio-made washing machines on these lists. In short: Our trading partners have fine-tuned the art of minimizing their own pain — and maximizing ours. Trump clearly believes he’s being “tough” with these other countries, and protecting American jobs, with his ineptly-designed tariffs. In fact, he’s putting many more jobs in other industries at risk. A report released this week by the Trade Partnership, a consulting and research firm, estimated that *the ratio of jobs lost to jobs gained from Trump’s trade actions will be about 16 to 1*: 26,280 steel and aluminum jobs gained, compared with 432,747 jobs eliminated throughout the rest of the economy. So Trump is alienating our strongest and (previously) most loyal allies. He is doing so even at the cost to our own economy measured in higher prices and lost jobs. Daivd Taintor at Talking Points Memo reports that [Trump Seems To Really Want Russia Back In The G–7: ‘It Would Be An Asset’] Trump says. For the second time in two days, President Trump called for Russia to be let back into the G–7. That little “something” just happened to be the invasion and annexation of a piece of a neighboring country’s territory. Nothing has changed since that would justify such a conciliatory move to restore Russia to a G–8 (or maybe a G–7+1 if the US stays in). Josh Marshall, also at Talking Points Memo, has the answer: We’ve Got a Problem. A Big Problem. There are certain frameworks and situations in the law in which it does not matter why something happened, it simply matters that something has demonstrably happened, to establish the point, making the finding or act. I have thought for some time that we face a similar situation with the man who currently holds the U.S. Presidency. Over the course of 16+ months, President Trump has acted consistently and with some success to destabilize and break up the western alliance (both its formal manifestation in NATO) but also its less formal dimensions in trade and other partnerships. He has also worked consistently on really every front to advance the interests of Russia. 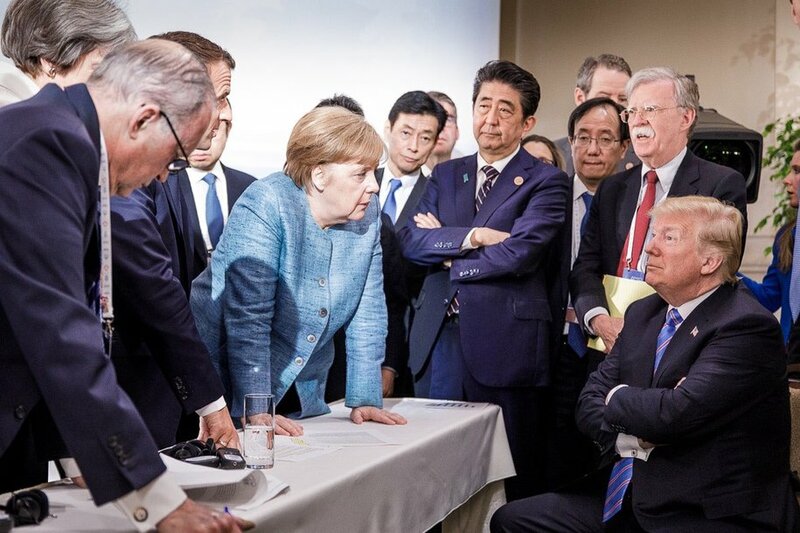 The last twenty four hours of attacks on our closest allies capped by President Trump’s seemingly out of the blue demand to bring Russia back into the G–7 (making it again the G–8 which it was for most of the post-Cold War era until Russia was expelled over the annexation of Crimea) simply brings the matter into a newly sharp relief. If candidate Trump and President Putin had made a corrupt bargain which obligated President Trump to destabilize all U.S. security and trade alliances (especially NATO, which has been Russia’s primary strategic goal for 70 years) and advance the strategic interests of Russia, there’s really nothing more remotely realistic he could have done to accomplish that than what he has in fact done. We have a President who clearly got a great deal of assistance from Russia in getting elected. We can argue about how important it was to his victory. But the reality of the help is not in any real dispute. His campaign at a minimum had numerous highly suspicious contacts with people either in the Russian government or acting on behalf of the Russian government while that was happening. That is a very generous interpretation. He’s doing all the stuff he’d have been asked to do if such a corrupt bargain had been made. At a certain point – and I’d say we’re clearly at or past that point – it really doesn’t matter whether we can prove such a bargain was made. I’m not even sure it matters whether it was explicit or even happened. The bank robber helped the teller get the job and now the teller just won’t seem to lock the safe or even turn on the alarm. We can debate forever whether the teller is just absent-minded or has some odd philosophical aversion toward locks. The debate may be unresolvable. It truly doesn’t matter. What does matter, in addition to waging all out war on our domestic institutions, whacking back our social safety net, relaxing rules that provide for our health and well-being, and trashing our nation’s law enforcement, Trump’s negative actions toward our global friends and allies play right into Putin’s hands. And that’s why AZBlueMeanie at Blog for Arizona calls Trump “Putin’s puppet”.